Join Sally Moret for the morning and learn how to screen print using paper stencils onto paper and a heavyweight canvas bag. This workshop is perfect for anyone with an interest in screen printing, either beginners or those who want to build upon any existing skills. 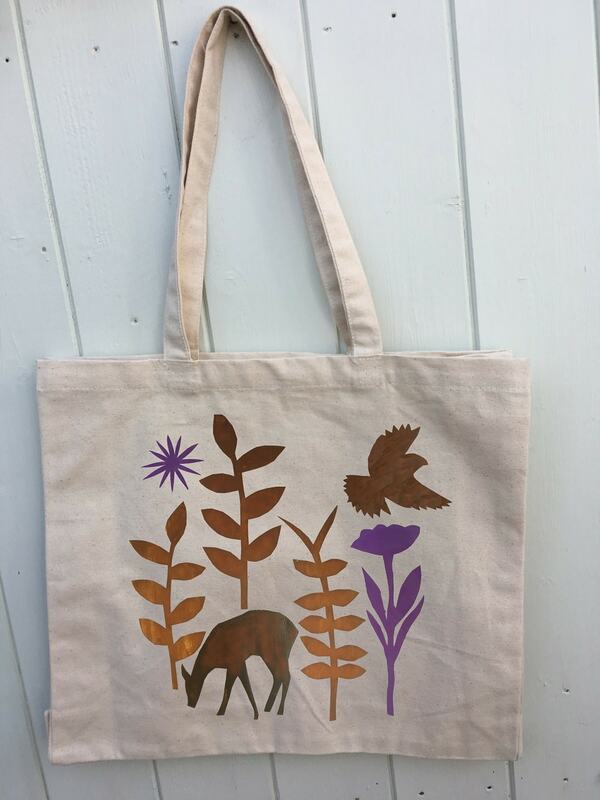 There will be lots of stencils available to use including hares, birds, flowers, foxes, ferns etc …. so nobody needs to worry about drawing imagery. Come along and make your bag stand out from the crowd and impress your family and friends with your creative flair! The number on this course will be limited to a maximum of 6 people to ensure one to one time with Sally. All materials and equipment are provided. Wear old clothing and bring an apron. It is your responsibility to notify us, in advance of attending any event at Bay Tree Cottage, of any dietary requirements or food allergies. Bay Tree Cottage does not assume any responsibility for adverse reactions to any foods consumed.